Standing out may prove challenging for many new entrants to the market for e-readers, expected by Forrester Research to double to 6 million devices this year. “Half the e-readers that have been announced [at CES] won’t be around a year from now,” says Forrester analyst James McQuivey. On Christmas Day, for the first time in its history, Amazon.com (AMZN) sold more digital books than the old fashioned kind. It was a watershed moment for the book industry—but it’s scaring the hell out of traditional publishers. Even though they make the same amount on sales of both kinds of books, they see Amazon’s digital dominance as a looming threat to their business, and with good reason. Their big worry: Amazon will end up with the same kind of pricing power in books that Apple has in music, and that the book industry will suffer the same kind of bruising decline. One goal for publishers is to dilute Amazon’s power. Hachette is selling e-books through more than a dozen partners, including Sony, Apple, and small retailers such as Fictionwise. By partnering with multiple outlets, publishers hope to regain control over pricing and gather purchasing data that could fuel future sales. They’re unhappy Amazon has dropped the price of some new digital best-sellers to as little as $7.99, compared with $35 for hardcovers. Hachette and Simon & Schuster plan to delay the release of certain digital books for several months to avoid undercutting the sale of best-sellers. “We are giving away the family jewels,” says David Young, chairman and chief executive of Hachette Book Group, which publishes authors Malcolm Gladwell and Walter Mosley. Publishers are typically paid about half the hardcover’s retail price, whether a digital book or hardcover is sold. But Amazon has been pushing to pay them less, and many publishers think cheap digital books will open the door to lower industry revenues in the future. Amazon, for its part, says publishers’ concerns are overblown. “We are selling a lot of books for publishers. We feel like that relationship continues to be a good one,” says Ian Freed, Amazon’s vice-president for the Kindle business. Tags:Amazon, Apple, Apple iPhone, David Young, Hachette Book Group, Malcolm Gladwell, Simon & Schuster, Walter Mosley. Here’s an interesting story I wrote about Amazon.com for this week’s big How We Buy Now package in BusinessWeek. Amazon has developed an excellent reputation for customer service and this story provides some insights into their strategy for developing customer loyalty, which is based around harnessing customer passion. When Amazon.com (AMZN) first began letting customers post reviews of products in 1995, many people thought the Internet retailer had lost its marbles. Letting consumers rant about products in public was a recipe for retail suicide, critics thought. Now, almost 15 years later, customer reviews are as common as hyperlinks, and a retail Web site that does not have feedback loops is considered passé or irrelevant. In fact, more than 5 million consumers have posted tens of millions of reviews on Amazon.com, says the Seattle company. Amazon’s review program reflects a new reality for the way consumers shop in the Digital Age: The Internet has become the world’s greatest research tool, and consumers hardly buy anything anymore without first getting the skinny online. Some 70% of Americans say they consult product reviews or consumer ratings before making a purchase, according to an October 2008 survey by Penn, Schoen & Berland Associates, a research and consulting firm. Amazon has played a central role in the change in consumer behavior by being the first successful Web retailer to embrace consumers’ views. “What we try to spend our time on is harnessing customer passion,” says Russell Dicker, Amazon.com’s senior manager of community. Here is a story I wrote in this week’s Top 100 Brands cover story about Amazon’s counter-intuitive and very effective branding strategy. The world’s best-known companies typically spend hundreds of millions of dollars a year on advertising and marketing to build their brands. The big news today is that Amazon released the new version of the Kindle, its electronic reader. I’ve been a big critic of e-books for years but it’s clear that Amazon is changing the game for e-books, perhaps in the same way that Apple changed the game for digital music. And that means authors–and the publishing industry–can no longer afford to ignore the Kindle. This would mark a huge shift in attitude and practice. I remember back in 2000, after I wrote my first cover story for BusinessWeek on Napster, Random House editor Jonathan Karp made me an offer to do an electronic book about Napster. I passed on the opportunity primarily because my goal was to write a real book, i.e. a book that you could hold in your hands and show off on a bookshelf. I also passed because the money was not huge and it wasn’t clear to me that people even wanted to read books in a digital version. Now, the tables have turned big-time. Amazon won’t say how many Kindles it has sold but estimates put the number around 500,000. Also consider that Amazon underestimated the demand for the Kindle because it quickly sold out and has been out of stock pretty much since last November. If the 500,000 number is true, that would mean Kindle outsold the first iPod in unit numbers by 32%, according to Citigroup analyst Mark Mahaney. In addition, Mahaney now estimates that Amazon will sell 1 million more Kindles this year, and another 3.5 million in 2010. Add it all up and we could have 4 million Kindles in the market pretty soon, and that, thanks to Amazon’s huge and loyal customer base, Mahanney says “it’s not too hard to see 10 million Kindles sold one day.” Can you say PLATFORM???!!! This is true. I am in talks with my publisher Harvard Business School Press to create a Kindle version of my book. The main challenge is over the rights issue. Depending on what rights you have negotiated, authors and publishers may need to renegotiate permissions to receive rights to publish certain photos and text for the digital world. But hey, it was inevitable that a technology that is thousands of years old would eventually give way to new forms of reading. And now that future has finally arrived. One of the great (and potentially humiliating) things about Amazon.com is that its Web site enables absolute strangers to publish reviews of your book. Caveat author. In April, one of my friends wrote the first review of my book on Amazon. I was thrilled–especially because she liked it and made me see the book in a new light. The funny thing is I didn’t ask her too. She did it completely on her own volition, without any bidding from me. Well, after reading her post, I started to get ancy about those darn reviews. I wanted more of them. I began to compare the number of reviews my book had generated with other books I’d been following. Amazon has a knack for exposing your insecurities as an author–writers’ obsession with the Amazon’s sales rankings is only the most obvious illustration of the site’s quasi-evil ability to inspire high anxiety. So I began asking a few other family members to pen an Amazon customer review. I pitched the task as a sort of family obligation. The result: deafening silence and inaction. As I checked my sales ranking in April and May, that lonely review became a thorn in my side. In June, though, I started to kick my daily addiction to the Amazon author page. Now, I only check my site once or twice a week. I was in the General’s class at HBS in 1961. When he discovered that I was an active duty military officer, he took an obvious personal interest in me (although he did not call me “Bernie”, as he called Samuel Bodman “Sammy”). Nevertheless, I will never forget the inspiring interactions with him and his varied guests from many walks in life, including Jackie Cochran, pioneer aviator. The author has done a first-rate job of pulling together details that shed light on a great man, as well as his wife. I finished the book in record time. I was General Doriot’s student at Harvard in 1960. He and his views had a profound impact on my life, both in business and personally. His emphasis on ethics, patience, creativity and freedom led me, in my various roles in life, to pass on these same qualities to all my associates. The book is well written and provides a useful insight on the private man. It’s too bad that this information was not available in 1960. In mid-February, I joined Amazon.com’s Associates program, an affiliate marketing system that lets you receive referral fees for sellling Amazon products. Around the same time, I had bought a bunch of Google keywords. Google is a great marketing vehicle but it has one flaw: There was no way to track sales conversion, or the rate at which people who clicked on my Google text ads actually bought the product I was selling. That’s what led me to Amazon Associates. I became a member of the program because it allowed me to track sales of my book by placing a bit of Amazon referral code on my blog. So after two months here are the results. I sold nine copies of Creative Capital and two other books, netting $13.13 in referral fees. My First Amazon Customer Review–5 Stars! 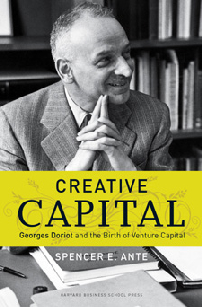 My friend Julie Chang posted a review of Creative Capital this week. And honest to god, I did not put her up to it, nor did I pay her! Americans always talk of saving France during WWII, yet at the same time, here was an intriguing French immigrant who rose to be a top professor of entrepreneurship at Harvard Business School, a founder of the venture capital industry, founder of INSEAD the European business school and to top it all off- played a critical role in saving countless American lives in WWII by leading the innovation and production of quality military equipment and supplies. Ante’s portrait is one of a driven maverick, visionary and Renaissance man who made an astonishing contribution to the war effort and modern business culture, and yet he seems very human and at times poignant. I was especially moved by Doriot’s tireless passion in helping American soldiers as well has his 48-year marriage to his wife Edna and how they spent their last years together. I loved this book because it’s such an unusual and valuable contribution to our understanding of the 20th century. Doriot has been an unsung hero in many ways, and by bringing his life into focus, Ante weaves people and international events in a way that makes us see our world as ever more fascinating, multi-faceted and interconnected.